Heat oven to 350°F. In medium bowl, knead cookie dough balls together with cocoa until blended. Divide dough into 12 pieces; roll each into ball. On ungreased cookie sheet, place balls 2 inches apart; flatten slightly to make smooth tops. Use fingers to press dough inward at top of each cookie, forming 2 V-shaped ears. Bake as directed on package. While cookies are baking, plan and assemble decorations. 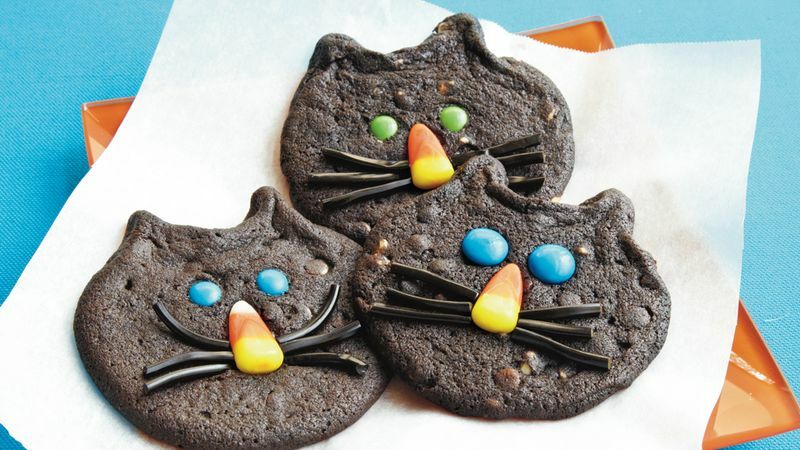 Immediately decorate hot cookies with candy-coated chocolate candies for eyes, candy corn for noses and string licorice for whiskers. Remove cookies from cookie sheet to cooling rack. Store cooled cookies tightly covered. It’s hard to tell when these cookies are done. Take them out at the time given on the package, even if they look soft. They will firm up as they cool.